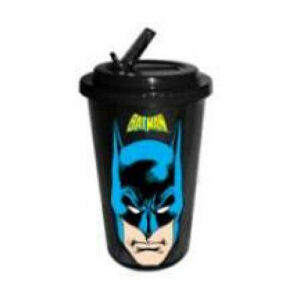 Be sure to get your Batman Face Plastic 16 Ounce Flip Straw Travel Cup hot of the truck! Fill in the Notify me when Available and you will be the first on your block to have a Batman Face Plastic 16 Ounce Flip Straw Travel Cup !! From the Batman collection by Silver Buffalo. Batman Face Plastic 16 Ounce Flip Straw Travel Cup. Hand wash only. Not dishwasher safe. Do not microwave. Silver Buffalo Batman Coffee Mugs shipping from Canada. No Surprise Border fees or Customs!